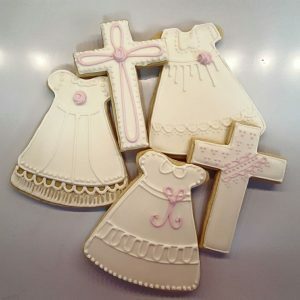 I contacted Four Oaks Bakery to make cookies for our granddaughter’s baptism. Emily made beautiful cut out crosses & fabulous decorated baptism dresses! The details were unbelievable on each cookie. They were so so pretty, we hated to eat them! The cookies were delicious! Emily goes above & beyond! You will be very pleased ordering from Four Oaks Bakery.